A facial exfoliator is as vital for men as it is for women. There is a whole variety of men’s skin care products; surely, they aren’t going to use the women’s products as both genders possess different types of skin. Men’s skin is thicker as compared to women’s, hence a separate range of products with more concentrated formulas. One of the most talked about brands nowadays is Bulldog that is specifically designing and formulating products by men for men. All of its products are solely made from essential oils and natural ingredients as it entirely avoids ingredients from artificial things. The Bulldog Original Face Scrub contains oat kernel, eight different essential oils, and shea butter. These components are necessary for maintaining the smoothness of the face and giving a good shaving experience. Along with that, it contains coconut shell pieces and olive seeds that gently exfoliate the skin. Moreover, this product doesn’t contain even a minute amount of sodium laureth sulfate, parabens, synthetic fragrances, artificial colors, or ingredients obtained from animal resources. The face scrub has a creamy texture that leaves the face squeaky clean and smooth with no residue. It has almost no scent to it, making it perfect for those people who don’t like synthetic fragrances. This product comes in a white upside-down, tube-like bottle with a flip-open cap. The cap helps the bottle stand still, which saves quite a lot of bathroom vanity space. The best thing about the cap is that it seals the bottle entirely when shut, protecting it from air pollutants and other impurities that can damage the formula. The Bulldog Face Scrub renders remarkable results. Whether you are using it after a long day of outing or before shaving, it will make your skin clearer, cleaner, and smoother than before. This product is designed for lessening razor irritation while shaving. Moreover, it makes the skin look healthier and glowing as it cleanses the pores thoroughly. This face wash is mildly abrasive so that it doesn’t irritate the skin or make it red after applying. With absolutely no signs of harsh exfoliating and skin breakouts, the Bulldog Original Face Scrub leaves the face feeling rejuvenated and moisturized. Doesn’t contain any artificial ingredients including synthetic fragrance, artificial color, and parabens as well as ingredients acquired from animal resources. Doesn’t use microbeads for scrubbing the face. Carefully picked ingredients which make the skin healthier and smoother. It isn’t gritty, so people with a lot of blackheads won’t be satisfied with it. 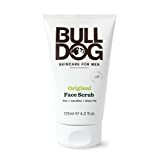 The Bulldog Original Face Scrub is one of a kind. Customers said that it is an excellent facial exfoliator that provides incredible results every time they used it. It has gained 4.2 out of 5 stars, which makes it a fantastic choice for users who are looking for vegan products. It is specially designed for thick and hard skin and according to users, it does its job very well.